Architecture is the triumph of Human Imagination over materials, methods, and men, to put man into possession of his own Earth. 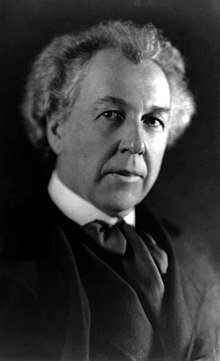 Frank Lloyd Wright (8 June 1867 – 9 April 1959) was an American architect, interior designer, writer, and educator, who designed more than 1,000 structures, 532 of which were completed. 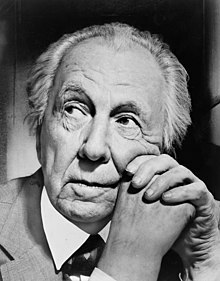 Wright believed in designing structures that were in harmony with humanity and its environment, with a philosophy he called organic architecture. If you would see how interwoven it is in the warp and woof of civilization … go at night-fall to the top of one of the down-town steel giants and you may see how in the image of material man, at once his glory and his menace, is this thing we call a city. There beneath you is the monster, stretching acre upon acre into the far distance. High over head hangs the stagnant pall of its fetid breath, reddened with light from myriad eyes endlessly, everywhere blinking. Thousands of acres of cellular tissue, the city’s flesh outspreads layer upon layer, enmeshed by an intricate network of veins and arteries radiating into the gloom, and in them, with muffled, persistent roar, circulating as the blood circulates in your veins, is the almost ceaseless beat of the activity to whose necessities it all conforms. The poisonous waste is drawn from the system of this gigantic creature by infinitely ramifying, thread-like ducts, gathering at their sensitive terminals matter destructive of its life, hurrying it to millions of small intestines to be collected in turn by larger, flowing to the great sewers, on to the drainage canal, and finally to the ocean. It is where life is fundamental and free that men develop the vision needed to reveal the human soul in the blossoms it puts forth. … In a great workshop like Chicago this creative power germinates, even though the brutality and selfish preoccupation of the place drive it elsewhere for bread. Men of this type have loved Chicago, have worked for her, and believed in her. The hardest thing they have to bear is her shame. These men could live and work here when to live and work in New York would stifle their genius and fill their purse.... New York still believes that art should be imported; brought over in ships; and is a quite contented market place. So while New York has reproduced much and produced nothing, Chicago’s achievements in architecture have gained world-wide recognition as a distinctively American architecture. As quoted in The Star (1959) and Morrow's International Dictionary of Contemporary Quotations (1982) by Jonathon Green. Here I am, Philip, am I indoors or am I out? Do I take my hat off or keep it on? If we wish to know the truth concerning anything, we'll find it in the nature of that thing. Wright thought not that he was God but that he brought or allowed God into the world through what he did, creating and designing. … Wright actually thought himself a prophet, which of course is a different to being God, or an angel.… bringing God into the world in an act of something like mid-wifery from the womb of nature, is not at all Moses-like. It is not a bringing down of Law from on high after personal coaching from God, but a bringing forth of a God already there in potential. Among the great modern architects, Louis Sullivan, Frank Lloyd Wright, and Louis Kahn were arguably deists. … Wright’s use of the word “nature” did not mean only what-we-find-outdoors. It was something deeper. Wright knew that when people speak of the “nature of things” they mean their very essence, the that-which-makes-them-what- they-are, which is always and only one step away from that-who-makes- them-what-they-are. … Wright thought not that he was God but that he brought or allowed God into the world through what he did, creating and designing. … Wright actually thought himself a prophet, which of course is a different to being God, or an angel. … bringing God into the world in an act of something like mid-wifery from the womb of nature, is not at all Moses-like. It is not a bringing down of Law from on high after personal coaching from God, but a bringing forth of a God already there in potential. There is no presumption of having seen or met God of the Bible. One makes the God one believes in happen. He's the greatest architect of the nineteenth century. His place in history is secure. His continuing influence is assured. This country's architectural achievements would be unthinkable without him. He has been a teacher to us all. The social outcome of the arts and crafts movement was not commensurate with the needs of the new situation; as Mr. Frank Lloyd Wright pointed out in his memorable speech at Hull House in 1908, the machine itself was as much an instrument of art, in the hands of an artist, as were the simple tools and utensils. This page was last edited on 12 February 2019, at 13:07.